Popular in Malaysia, Indonesia and Singapore. Bite-sized pieces of beef, mutton or chicken are marinated in spices, then skewered through thin bamboo strips, and barbecued over charcoal fire. 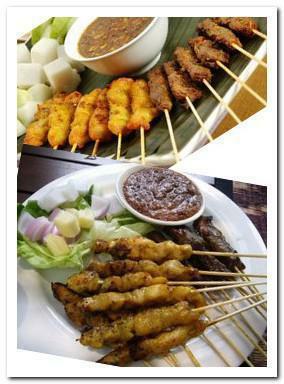 Satay is served with Ketupat (rice cake) and a raw salad of cucumber, pineapple, and onions. Sweet and spicy peanut sauce accompanies the dish. Cut the chicken meat into small cubes. Grind the Spice Paste in a food processor. Add in a little water if needed. Marinate the chicken pieces with the spice paste for 10 - 12 hours. Thread the meat on to bamboo skewers and grill for 2 - 3 minutes each side till the meat are cooked. Serve hot with fresh cucumber and onion pieces.